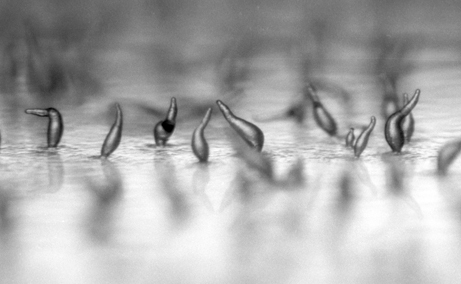 Dictyostelium inspires creativity, and this page contains the first beautiful examples. If you would like to share art that finds its source in Dictyostelium, created by you or an artist you know, please contact dictyBase. Project Homo Amoeba investigates the ideal of flexibility. One is flexible when one can adapt to all situations. For humans, this is more an ideal than reality. For amoebas, being elastic and flexible is no exception. 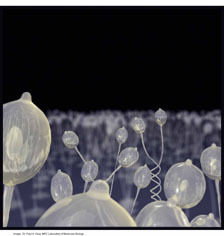 Dictyostelium serves here as a representation of the ideal. A man attempts to imitate the movement. Please click on the YouTube link to rate this movie. and you.... you must obey. while we.... we must die. Download the pdf version of this poem. 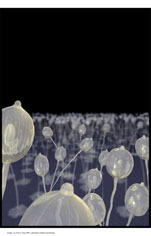 Graphics generated when the Nature cover was created for the publication of the Dictyostelium Genome (Nature, 5th May 2005). Permission is hereby granted by the copyright holder to use these images for any non-commercial use, including inclusion in web pages, presentations, and reports. 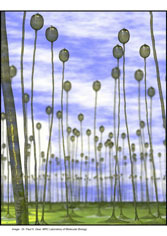 The images should have a minimal attribution of "Copyright, Paul H. Dear, MRC Laboratory of Molecular Biology, Cambridge, UK"
Image by Matthew Springer, Stanford University. See it at National Geographic. Project We're Not So Different - "Altruistic Amoeba"